Debbie Philp holds space for you, beautiful being, to feel into the radiant sacredness of your body and to root deeply into Mother Earth. She works with you – one of the blossoming healers of the world – as you discover your innate power, your inner wisdom, and your ability to nurture yourself and others. Her offerings, inspired by yoga and shamanic practices, help you move into your physical being, to unlock your intuition, and to honor the awesomeness of your spirit. She passionately desires that you peel back the layers of self-doubt to reveal the capable healer that you are when you stand as your authentic self. We, the human species, are standing at a precipice. The belief systems – religious, economic and social – that have shaped society through the rise of agriculture, trade and industrialization are beginning to crack at their foundations. We have used the Earth’s resources unsustainably and climate catastrophes threaten our survival. The patriarchal order is being chipped away and chaos seems imminent. Astrologers say we are moving into the Age of Aquarius. Whatever you call it, we are at the edge. Will you retreat, or are you ready to jump into the new unknown? Before you turn away from the abyss, take a moment to stand or sit with your feet firmly down. Rub the palms of your hands together. Keep rubbing until they are hot. Then, keeping your palms facing each other, separate them about an inch. Feel that? Continue to face your palms in, but move them around a bit. Open another inch, bring them closer together, slide them across each other. You are feeling the living energy that flows through all of creation. The presence of this living energy comforts me as I curl my toes over the edge. I am not alone, as an individual or even as the embodiment of all of humanity. I am part of a global ecosystem, physically and energetically, just one cell of the organism that is Mother Earth. Humans, just like the animals and plants, the water, the rocks, soil and sand, and the air itself, have always known change. Day turns to night and back into day, the tides advance and ebb, summer fades to autumn, and autumn gives way to winter. Winter ends and spring comes. Our nomadic ancestors understood the lack of permanence, but “civilized” peoples walled themselves in with rock and tried to stay put. We have separated ourselves from the natural cycles of change, hoping that we can have growth without ever experiencing death and fallowness. Unfortunately, it is that disconnection that keeps us from knowing the ground is crumbling beneath our feet. The modern revival of ancient shamanic practices is an invitation to reconnect. Although the word “shaman” is believed to have originated with the tribal people of Siberia, shamans, or medicine people, existed in almost all indigenous cultures, including the Celtic people of the European continent. Most commonly practiced today is shamanic journeying – entering into an altered state of consciousness to receive messages from Spirit – although the envelope of modern shamanism includes herbal medicine, various energy healing modalities, movement and dance, and even environmental activism. Armed with these techniques, we can feel our way into our place in nature. We can breathe with the trees, receiving the oxygen they give and releasing carbon dioxide back to them. We can learn from, and be supported by, the animals and plants we exist with. We can view the natural cycles as sacred, and therefore open to change as an expression of living energy, to be revered rather than feared. Like many healers, I did not realize when I stumbled through my first yoga class in a gym 20 years ago that I was taking the first step on a long journey. At the time I was a stressed-out office worker – suffering from fatigue, frequent headaches and shoulders that barely moved. My posture was so bad I only ever saw what was happening on the ground in front of my feet. I’d never done anything you might consider athletic. Yoga transformed my body, my mind and my life. I started slow, worked on the basics, and ten years later I touched my toes. After twelve years I could keep up in a power yoga class. I turned 40 during yoga teacher training. Since then I’ve completed triathlons and half-marathons, and gone rock climbing. I’ve experienced true bliss on a mountaintop and in Savasana. I am strong enough to get outdoors, and peaceful enough to be still and fully experience the natural world. The magic came in realizing this was not something different, but a return to what I knew when I was the child who played with hermit crabs in tide pools and bridled a split rail fence to ride off on grand adventures. I have come to understand that conversing with birds and squirrels is not a childish pursuit but, rather, childlike – innocent and open to the shared wisdom of nature’s spirit. In 2009 I ditched the office job, choosing to honor the happier, healthier and more authentic path I found myself on. I opened to the truth that I am a healer, and I actively strive to bring healing to myself, others, and the Earth. That is why I will so passionately guide and support you on your own healing path. We may connect through yoga. You might join a group coaching program, or work with me one-on-one. Perhaps you will receive Shamanic Reiki, or participate in an aromatherapy workshop. No matter how we come together, you will be held and heard as the sacred healer you are. Do you want the nitty-gritty resume details? 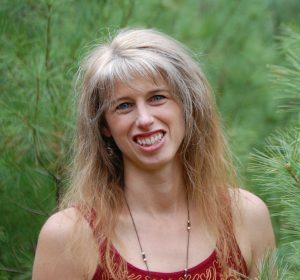 In 2008 I completed 500 hours of yoga teacher training with Tracey Ulshafer at One Yoga and Wellness Center in East Windsor, New Jersey and have taught more than 3,500 yoga classes since then. I have deepened my knowledge at Kripalu, completed Sadie Nardini’s Evolution training, and practiced with Shiva Rea, Seane Corn, Bryan Kest, Danny Arguetty, John Friend, Suzanne Sterling, Sianna Sherman and David Swenson. I became a Holistic Wellness Coach in 2014. I received my training from the Institute for Integrative Nutrition, where I learned about more than one hundred dietary theories and studied a variety of practical lifestyle coaching methods. In 2014, after practicing Usui Reiki at Level II for 15 years, I completed Reiki Master training with Dina Kennedy in Long Lake, New York. In 2015 I completed Llyn Robert’s Shamanic Reiki Master Practitioner training at Omega Institute and, in 2016, became a Shamanic Reiki Master Teacher. I am now a Senior Assistant with Shamanic Reiki Worldwide and continue to develop as a practitioner and facilitator through the Evolving Master Teacher program. In 2018, I completed a training with Heartblood Cacao to offer cacao ceremonies. I studied aromatherapy for physical and emotional wellness for a number of years, including a course in Clinical Aromatherapy. I have been certified as an ACE Personal Trainer with Mind-Body and Behavioral Change specializations. I am on a nature-centered spiritual path and love to create circles where I can share ritual with like-minded people. True North Yoga came to be as a concept in 2009 when I was teaching yoga in the basement room of the Schroon Lake Community Church. In 2011, it took physical form as a yoga studio in a Schroon Lake, New York storefront. This dedicated space fulfilled my vision of offering not only yoga classes, but a sanctuary from the daily grind of harsh winters and busy summers in our Adirondack town. In 2012, I created the True North Advanced Yoga Studies and 200-hour Teacher Training program, a Yoga Alliance Registered Yoga School, to help spread yoga in our North Country region. As of 2018, 35 yoga teachers have completed the 200-hour program, which has been hosted at True North Yoga and at two other Adirondack yoga studios since its inception. As a result, the True North Yoga studio currently has a lovely group of teachers devoted to maintaining my vision of a safe and welcoming place for yoga practitioners of all levels. Yoga classes can now also be found in other Adirondack communities, making the practice accessible to many who had been isolated by distance from teachers and other practitioners. In 2016, the program evolved into Energetics of Yoga Teacher Training and expanded to include an advanced four-module program for teachers who wanted to advance to the 500-hour training level. While the training is no longer directly affiliated with the yoga studio, I am still committed to bringing yoga to underserved communities and intend to continue to offer trainings in the years to come. In 2017, True North Yoga expanded into a second studio location in Keene Valley, New York. We are now able to offer yoga classes in the High Peaks region of the Adirondacks, and the larger Keene Valley space is perfect for weekend trainings and workshops. True North Yoga’s studios are wonderful spaces in which to practice yoga for residents of and visitors to the Schroon Lake and Keene Valley, New York regions. I invite you to visit the studio’s website for the class schedule and upcoming events.